6.31 points at 13 votes (rank 564). 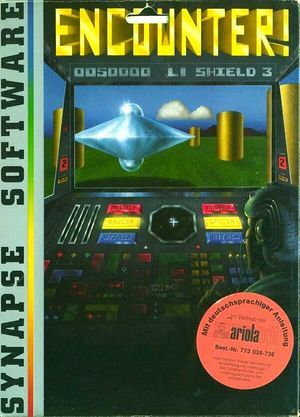 In the first level the computer enemies still play only half-throttle. 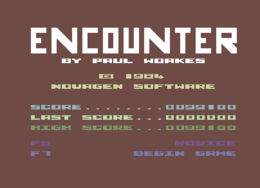 Encounter is a shooter in the first-person-perspective by Novagen Software from 1984. According to the story, they have discovered a planetoid during a reconnaissance flight through space and the planet has no noteworthy characteristics except for a great number of columns that are regularly aligned on one plain. Being curious about what this is all about, they beam a probe onto the surface, which is attacked by UFOs and missiles instantly after landing. It turned out that this must be kind of training area of a long lost war race that trained their reflexes against an automated defence system. 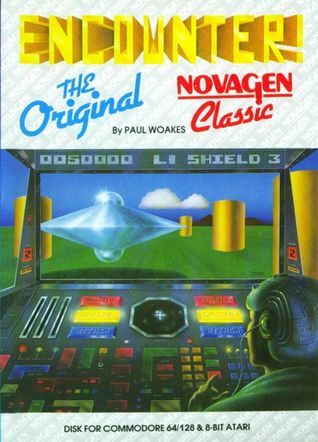 As a real sportsman you accept the challenge of course and now try to shoot in every level a varying number of UFOs and guided missiles, to avoid the hostile shoots and finally to get through a stargate to the next, more difficult section. As a help, you have a radar screen available that shows the position of the enemy that you need to search for and shoot. Guided missiles on the other hand, do not need to be searched actively, they find the player by themselves... and this most of the time very fast with deadly consequences. 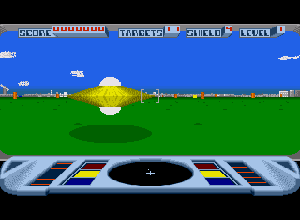 The player's probe has at the beginning four shields, losing the last shield ends the game. A bonus shield is given, if you make it to destroy all enemies in a level. 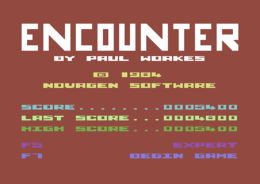 One can assume that Encounter was inspired by Atari's arcade machine Battlezone which has vector graphics but where the course of the game is mostly identical. Multiple missile attack from all directions. 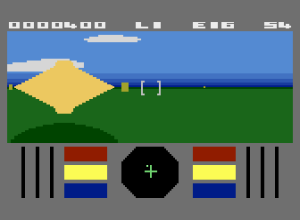 Looking through the window of the cockpit you see a (in the first level still green) plain above which are some clouds, at the horizon you can recognize some stray mountains, but they are unreachable. 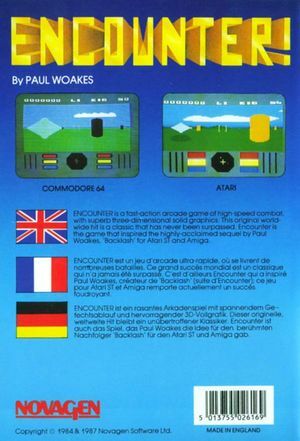 The columns, UFOs and missiles consists of large-sized, unicoloured sprites in the simplest geometric shapes: blocks for the columns, diamonds for the enemies and circles for the shots, which does only look passably good, but benefits the game's speed. The scrolling, which is the illusion of "moving forwards" by the columns passing by the vehicle of the player, is very fluent and also the attackers are displayed jitter-free and very fast. An eliminated attacker explodes in a cloud of rotating diamond-shaped single parts. During this you can effectively satisfy your primary instincts after a tough duel with an especially persistent UFO by racing through the splints of your enemies. As the UFOs have always the same shape and only change the colour depending on the type, there is a lack of optical diversification. Only the colour of the battlefield changes in every level and some of them take place at night. In these levels you can even recognize with some imagination the constellations Aries, Little Dipper, Lose Screw and Crazy Writer of Wiki Articles. Fitting the simple graphics, the sound is also not very extravagant. The game does not know any music and there are only a handful of short sound effects for shooting sounds, explosions, the opening of the star gate and so on. The UFOs sound like UFOs sound after all, a strange, electronic curring, as certainly everybody has experienced live and the guided missiles announce themselves with a turgescent humming tone. "...and here a traffic announcement: On the hyperdrive between Alpha Centauri and Zeta 7 beware of the wrong-way driver!" "One??? There are hundreds!!!" In each level there is a random number of enemies (between 10 and 19), i.e. UFOs or missiles to be shot, whereupon you get an extra life and the black star gate to the next level opens for a few seconds. After driving through the gate, you need to survive a hell of a ride lasting approx. 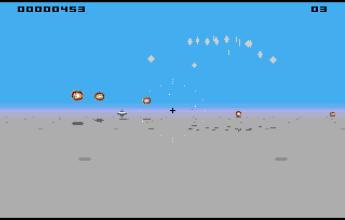 30 seconds through a swarm of missiles, that fly towards you with enormous speed and when colliding with one of them you lose a shield and you need to play through the previous level again (moan!). Instantly after the start of the game you find yourself on the battlefield, surrounded by the numerous columns that cover the field in a grid system. These columns block your own movement and are indestructable. Furthermore, they deflect your own shots and the ones of the attackers. With a little luck you can quasi hit the enemy or get respectively hit "by bank shot". The columns also offer cover from hostile shots in an emergency. There are 17 different types of UFOs that are worth between 100 and 1600 points. They differ by their movement and shooting patterns, so there are e.g. UFOs that mainly try to avoid you, while others, especially in later levels, release scattered shots, clouds of shots or even permanent fire. Very wily are the mine UFOs, which do not shoot and at first only try to avoid the player while beeping harmlessly, but after some time detonate in a huge ring-shaped formation of shots. All UFOs emanate from the white warpgate that need not necessarily be in the players field of vision and only appear indivdually. 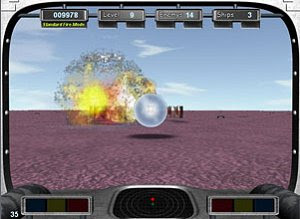 Even worse than most of the UFOs are the missiles, that out of a sudden come racing towards the player's position from a random direction and are announced with a turgescent warning sound. The only thing that helps here is to turn into the attacker's direction at the right time, go into reverse and eliminate the missile approaching at zigzag course by permanent fire. 1 to 8 : Choose one of the 8 levels for the game. However, the level needs to be "unlocked", i.e. needs to be reached in normal play, before being able to choose it directly. Then start with F7 . If a white UFO warpgate materialises before you, instantly shoot at it and with a little luck you will get the UFO before it can get dangerous. 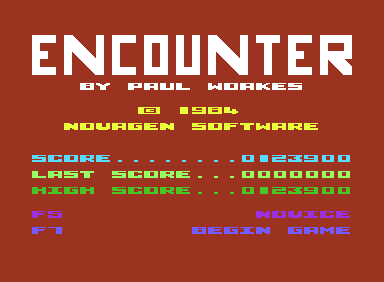 In later levels it is not advisable to go close to the UFOs, as these can suddenly fire whole salves of shots. In the warp phase between the levels make only short and small corrective controlling movements and do not let yourself get impressed by the disturbing noises. During an attack by missiles never retreat directly straight but diagonally in case you get stuck at a column. The version by Remember has all trainer options that you can wish for. If you have this not available, you can also try POKE 30430,0 or POKE 34722,0 for invulnerability (not tested!). 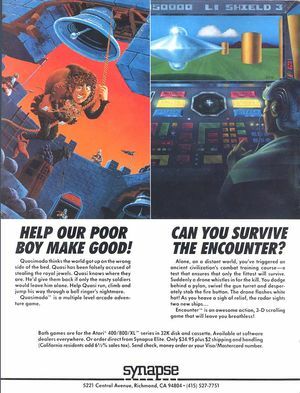 Robotron2084: "Encounter begins very boringly, but then grows with each level to a really mad speed, where the shots fly crisscross and you sometimes only escape the enemy's hail of shots or an approaching missile by a whisker with more luck than brains. In my opinion the game suffers from a crucial design fault: which is that you need to repeat the previous level when you do not make it through the intermediate sequence and this can bug you quickly when you need to go through the boring first levels repeatedly. Here, it would have been better to let the player simply lose a life and the let him into the next level. Also it would have been good to mark the different types of UFOs by using specific sounds, this would have given on the one hand more atmosphere and on the other hand given the player a possibility of recognizing the type of attacker. I think the game is not bad, even remarkable concerning the programming, but on the long run it is a bit too monotonuous to fascinate me for long. 6 out of 10 points." No trace of tactics: in Backlash everything just gets pulverised. 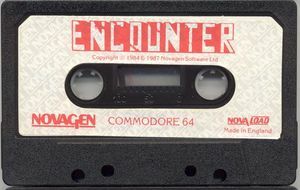 In 1987, so four years before the Encounter version for the Amiga, Paul Wakes developed "Backlash", an inofficial follower of Encounter for the Amiga and the Atari ST. 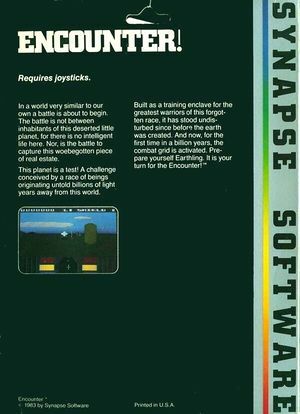 In this game the emphasis is more on action and you are attacked nonstop by several enemies. The columns are missing almost completely here and there is also no intermediate sequence, so that Backlash is more a wild shooter than an immersion and a further development of the Encounter idea. 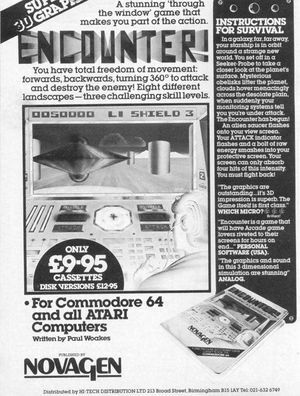 With the for the time spectactular 3D vector graphics action adventure Mercenary - Escape from Targ and the follower Mercenary - The second City Paul Woakes gained some recognition in 1985. Longplay specialist DerSchmu plays through Encounter for us (shortened version). Advertisment for the European area. Combined advertisement with Quasimodo by Synapse Software for the American market. This page was last modified on 9 May 2016, at 11:25.